6500k vs. 12000k for plant growth. Tank shot and glosso. Glosso is in between 1"-2"
That's what I've heard as well. Unfortunately I am financially unable to get geisemann since they are relatively on the high priced end for bulbs. Since I have True Lumens brand of the aquaflora bulb I'm really considering the GE Starcoat 6500k bulb . It could possibly make the same combo for a cheaper price?? Where are you shopping? 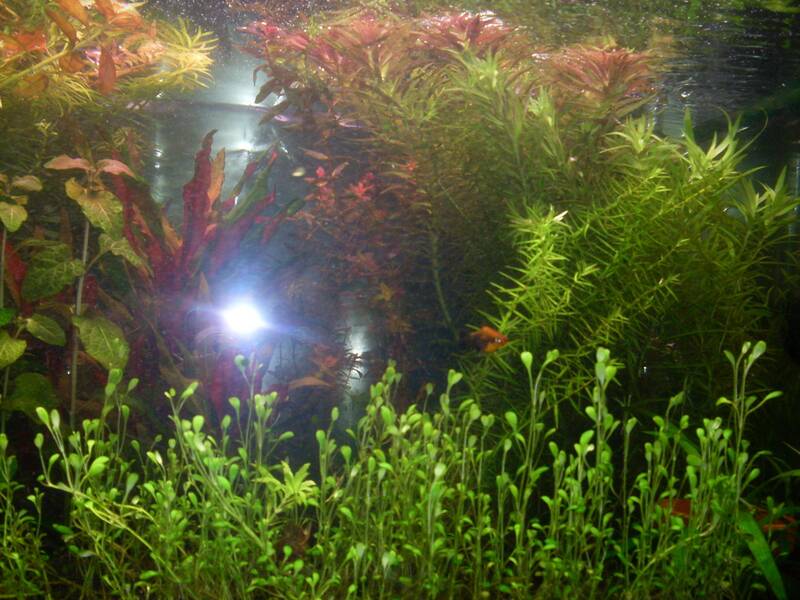 Aquacave is where I've always purchased my bulbs for fw, and some for sw. They don't charge oversize shipping, and the geisemann bulbs are only $5-10 more than the GE's... If that $5 to $10 is a make or break thing for you, then the GE will be fine, but speaking from experience, it's well worth the extra every year for the geisemanns. Just be glad you don't have 6 or 8 to replace! Okay thanks! I am going to really do some thinking about it. Do you think they would definitely help carpet my glosso from my bulbs that I currently have? I agree with aqua_chem I'm not suggesting that you can't get good plant growth with higher color temp bulbs, what I am saying is that there's a lot research that supports that plants grow better and faster with bulbs in the 6400K to 6700K temp range. The higher the color temp the closer you get to blue, the lower the color temp the closer you get to yellow and red. I call BS on this. Temperature is an extremely poor metric for bulbs. It is literally judging a book based on its cover. You need to consider the ENTIRE spectrum, not just what the color appears to be. The reason the blue bulbs are bad is because the spectrum is lumped entirely in the blue without any red or green. I bet that 10000K+ bulbs that are designed for FW have sufficient green/red light to grow plants. I think they'll cause more growth than the bulbs you have... maybe some better color too... but what you have will work. Maybe wait until you need to change bubs before you upgrade? So what do you advise to be the best t5ho bulb that'll help being out reds in this such as rotala and assist is the horizontal growth of glosso?